The last day couldn't have been any more perfect though and we were finally able to run out to the island we wanted to. As soon as we got in at one of our favorite spots it was just yellowtail city! 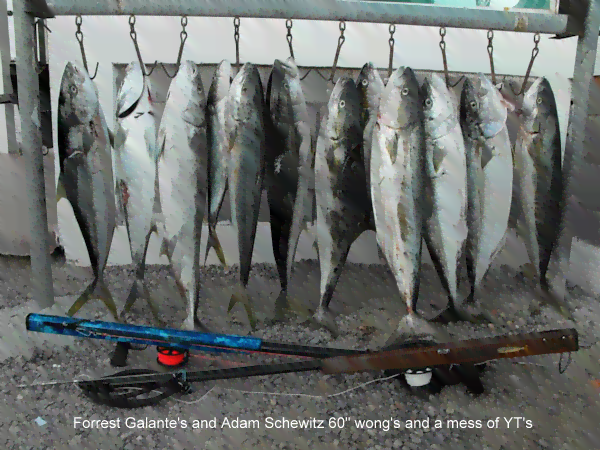 It was Forrest Galante, myself and another friend and we had wide open yt action for the next couple hours until we literally didn't have any more room for fish on the boat. All the fish were in the 25-30 lb range and was just one of those days you dream about! 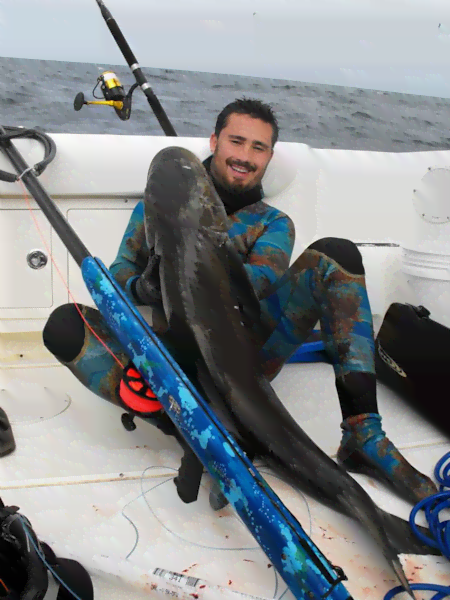 After the kino trip I flew to Florida and once again the wind kept me from getting out as much as I would've liked and kept me away from some of my spots but still managed to get this slob of a cobia off the sw gulf coast. Got a couple smaller cobias, nice snapper and some monster AJs as well on the trip but unfortunately not any pics of those. Thanks again for a great gun Daryl! Couldn't be happier with it, hopefully will have a good video of the yt action soon and I leave for Zanzibar at the end of the month for 6 months so hopefully will have many more pictures to share. Hope all is well out on the islands. Your gun continues to amaze. Performed flawlessly on a recent trip down to Cedros island helping me take four big yellowtail and couple big broomtail groupers, one of the groupers shots went right between the eyes, and all the way down the spine. Took twenty minutes just to cut the shaft out! I attached a picture of the first two YT's of the trip. 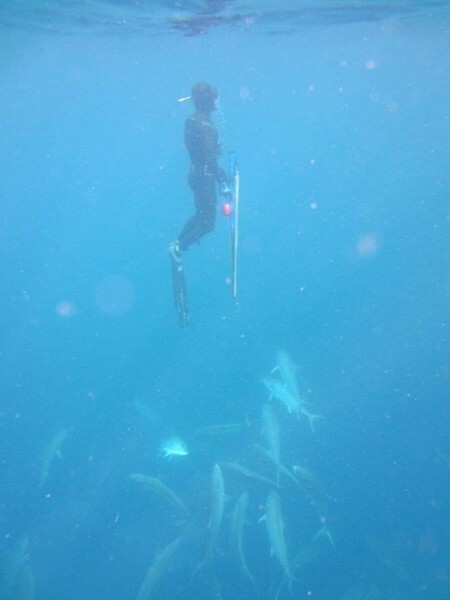 Hope all is well out in Hawaii and that you've had some good adventures out spearing. I definitely have since we last talked. 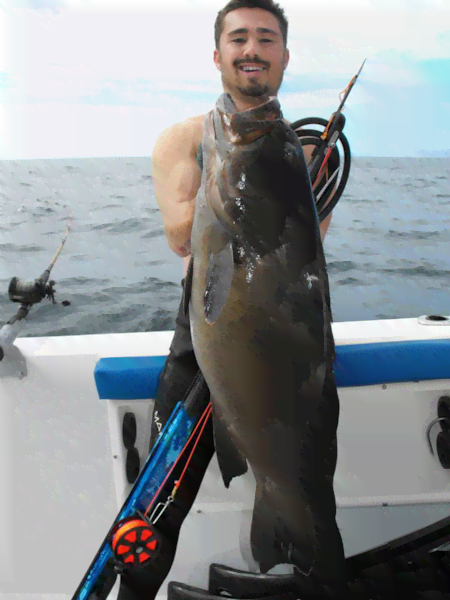 I've gotten some big groupers and some small yellowtail out in mexico (let a 40 lb yellowtail get off the spear! ), shot some nice permit, AJ's, and snapper out in the gulf towers off of Marco Island that I frequent and the 55 magnum has been absolutely incredible throughout. I attached some underwater pictures of me diving with some AJ's out at the tower with the gun. It was on my last trip out to the towers that a permit broke the mono and took my shaft and slip tip away with it so I'm in need of a new spear! The same set-up would be great except for replacing the mono rigging with dyneema for a little better abrasion resistance, I'm not sure if you can do the rigging without the gun there but if not just send all the components for the break away rig and I'd be happy to set it up myself. I also would like to order a flopper shaft of the same width set up with dyneema and also set up to breakaway. I know this is very late notice but I will be heading out to the tower again this next weekend and if possible I'd like to get the shafts in time for the trip. If that's not possible I'll probably cancel the flopper shaft order and see if I can't pick one up locally for this weekend, I also still have a thinner flopper shaft from when I ordered the gun that should do the trick if need be but just not sure how it would hold up to a nasty cobia! Please let me know what's possible and call with any questions. Paypal works for me if you want to send out the bill. On a side note I'll be moving to Ft. Lauderdale (With a boat right out back, close to the Port Everglades Inlet) on march 1st and should be able to get over to meet you in person when you come for the blue wild expo, I'm looking forward to it! Thanks and give me a call with any questions or to chat. 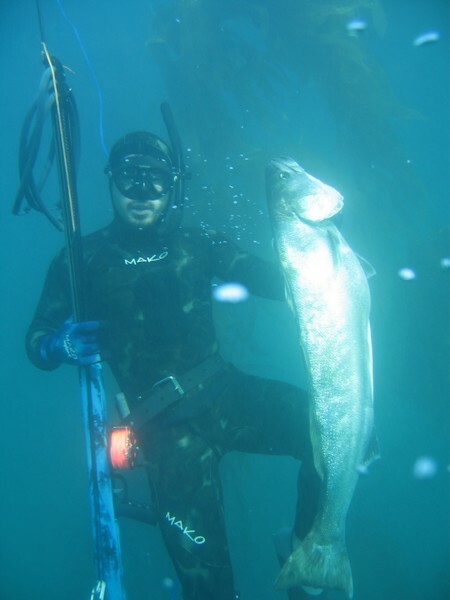 Well after a long summer away from spearing I finally got back in the water and had a great trip to visit my good friend Forrest Gallante out in California. I had a couple weeks out there so we planned a couple of different spearing excursions! The first trip took us to the Colorado River for a canoeing trip down the beautiful Black Canyon. It was suggested by Forrest's Uncle who along with some friends of his accompannied us on the overnight trip. We launched just downstream of the impressive Hoover Dam and began the 12 mile trip. New to the area and freshwater spearing we hopped into the super clear 54 degree water and it didn't take long to figure out some great spots and the type of habitat we were looking for to spear some striped bass. We drifted most of the day and just hopped into the canoe's on occasion for a breather or to pull up on a beach and check out some of the great side hikes of the river. By the end of the day I'd shot a couple 10-15 pound stripers and Forrest also had shot one, We'd also gotten a couple nice catfish to fry up at the campfire that night and we definitely ate well. the next day was a little quieter on the striper front but still fun. 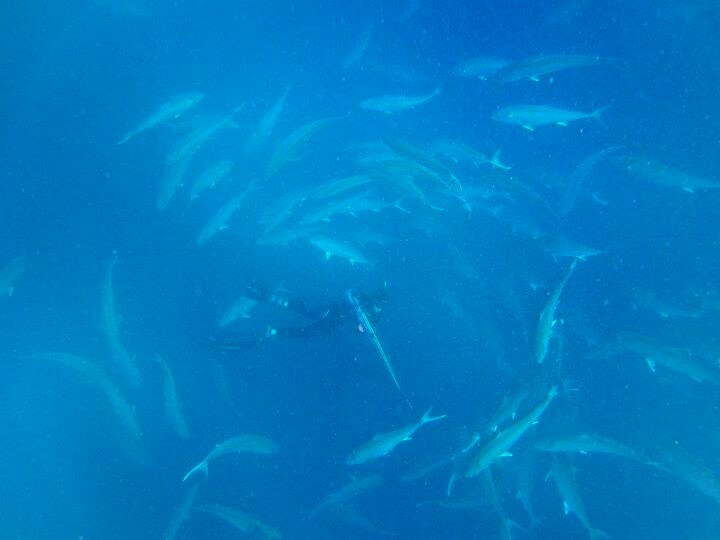 It was some great spearing, good to shake off the rust of not spearing for so long and a great way to start the trip. The river environment didn't lend itself to a big gun so i used a 90 cm railgun instead of the magnum so I was very excited for the next excursion to get a chance to finally use the gun. 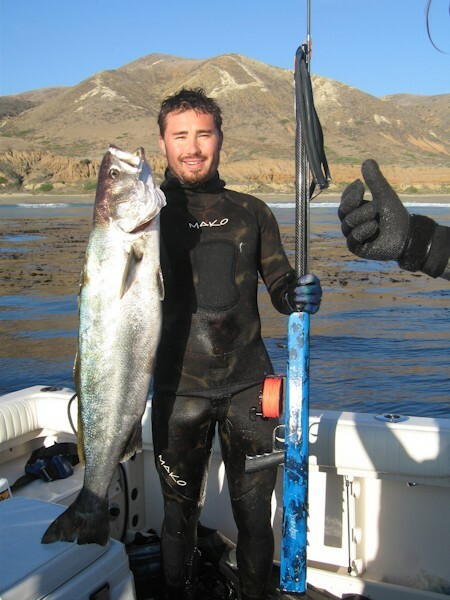 The next trip we took Forrest's 20 ft boat out of Santa Barbara out to the channel Islands to chase some white sea bass! After the crossing we jumped in and I got to load up the gun for the first time! after an unproductive hour at the first kelp bed we switched spots and the action started. About ten minutes at the kelp bed I saw my first WSB, I dropped down on it but it swam away and I was unable to line up on a shot, I hadn't spooked it though so I waited motionlessly to see if it would return, about a minute later it came swimming back right at me crossing right below me, i was right out in the open and if I had of tried to dive I would have spooked the fish for sure so I was forced to take a top down shot and with the very first trigger pull I nailed a nice 25 lb WSB! It took a while to haul it in and keep it clear of the kelp but the slip tip held and it was a great feeling to land my first WSB. It was an especially great day as it happened to be 6 years to the day that my brother had passed away so it felt like it was meant to be. Forrest ended up shooting two WSB and I had a second larger fish tear off the slip tip but still a great day out there. I attached some pics of the fish with the spear gun on separate emails from my phone. My sister also made the trip out with us but not to spear and we spent the night cooking up some calicos we shot and had a great time. The next morning we speared a little more and Forrest shot one more WSB to complete his limit! after that we made the crossing back before any bad weather could stir up. A great trip! For the final spearing trip we planned to go spearing at Kino Bay, Mexico at a friends house but the plans fell through last second so in a quick change of plans Forrest and I decided to head to a place we both always wanted to visit and made our way down to La Paz area to Bluewater Spearfish at Palapas Ventana. 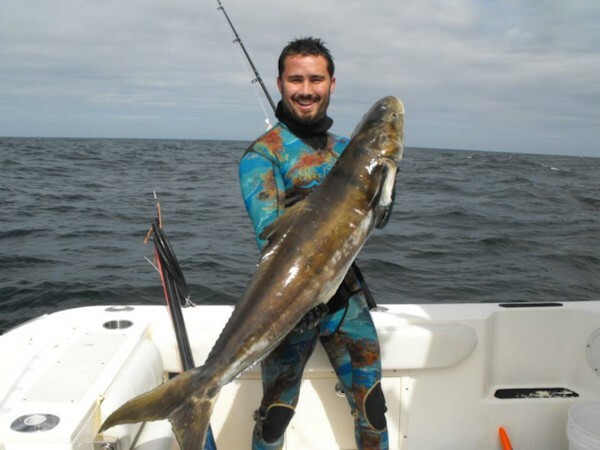 We had three days booked and our timing couldn't have been worse as far as pelagics were concerned. Unusually warm water kept the fish away except for a 30 minute period on the second day... I was the lucky one who had a Wahoo come up to my throwable flasher, i dropped down on the fish and as it noticed me it started to swim away so I swam away from it and got it to follow, after a long game of cat and mouse it was still hanging just outside of where i thought i could put a good shot on it. 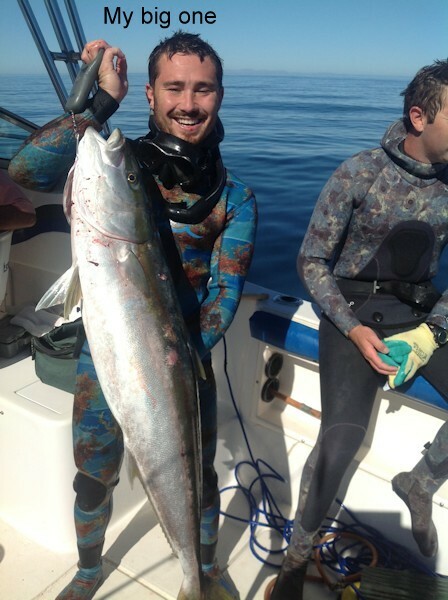 I went for air hoping to keep it around but never got another chance, It was incredible to see a wahoo and I'm all the more pumped to get my first one. About ten minutes after that I had a Striped Marlin come in right on my flasher, now Me and Forrest had been discussing wether or not we wanted to shoot a marlin due to their importance as apex predators and neither of us were sure what we would do if we saw one. I dove down and ended up being able to get very close to the marlin and had a shot lined up but decided not to take the shot. Still incredible to see the fish! After that I saw a very nice YFT swim by but never got remotely close as it flew by and didn't take a second look at the chum or flashers, forrest got a little closer to that tuna and saw some others but couldn't get off a shot. That was it for bluewater fish, we were still able to slay a bunch of pargo and grouper and I got a much better feel for the gun as the trip went on. What an incredible gun! It was even better than I thought it would be! by the end of the trip I was very confident with it and was pulling off some incredible shots with no hesitation. The gun really shoots like a laser with incredible range and the loading tab makes loading an ease. The one concern I do have is with the slip tip, The slide ring doesn't move easily up and down the shaft and on at least one occassion this caused the tip not to deploy as the slide ring got caught to far down and pinned the tip on. Fortunately, on this occasion I was able to stone the pargo so I didn't lose that fish but I'm worried this also might have been why my second WSB tore off, I think I should be able to prevent this by putting some tape preventing the slide ring from going down too far, let me know if you have any other suggestions. This will be my go to gun for a long time and I can't wait for my next adventure! 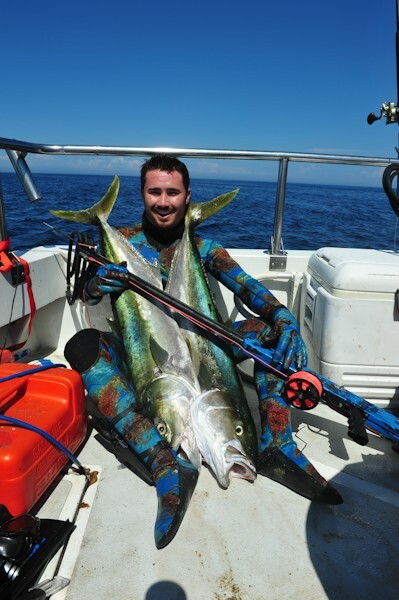 Fortunately I shouldn't have to wait too long to get out spearing again as I'm writing to you from my new place in Key West, FL and I've already made some spearing friends, I'll keep you updated with all the great fish I take with the gun. Hope all is well and thanks again for an incredible Gun.